As anyone that owns a business can attest, posting daily on social media can be a hassle. The biggest issue is finding the time during the day to make at least one post, let alone a creative one that will be engaging. But that's a topic for another blog. Now, let's get back to the topic at hand. Daily social media posts. If you aren't doing this as a part of your daily routine, you should be. These posts are critical to keeping your business relevant and helps to grow an audience that is interested in your services or goods. The sad fact is, most small business owners do not have enough time in the day for themselves during their regular business hours. Then once you have to factor in social and family life, it may seem impossible to get that all-important post of the day in. This stress is a big reason for the boom of businesses hiring social media experts to handle that aspect of the company. This move may alleviate that stress, but it does prove to be costly, as you have to add a new person to your payroll and give them a competitive wage to make them want to work for you. This is not a new feature, in fact, it has been available for a number of years and is not a hard thing to do. 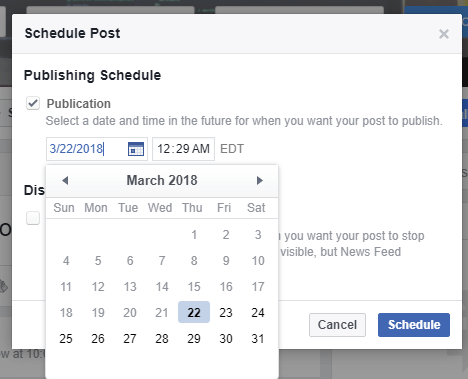 Facebook has even taken the time to explain how to schedule posts in their help center (found here). Typically, it takes 30 minutes to an hour to do these posts. The time is mostly spent on creative content and making sure your message hits the intended targets. You can even set up the exact date and time you would like your posts to go live. These tools have made scheduling social media updates easy. They are very responsive and also allow businesses to edit them after they have been created. With that said, the hope is that you can find 30 minutes to an hour to set up your week and promote your business. However, if you can't take that time away from your business or personal life marketing agencies can help you out. Yes, it may be an extra cost but in most cases, it can save you $20k/year vs hiring a social media coordinator. So if you are looking for someone to hand over your businesses social media reigns to contact CIM Marketing Solutions & get your FREE consultation today.